Today is the first-ever National Parchment Day, celebrated on the last Wednesday of June to bring awareness to those who have not yet discovered the joy of working with culinary parchment. The holiday was created by PaperChef, a leading producer of premium culinary parchment. The right way to declare a holiday is to submit a proposal to the federal government, state or local government. A less official way to do it is to submit it to the National Day Calendar a commercial venture originally begun as a hobby by two enthusiasts in North Dakota. WHAT IS CULINARY PARCHMENT PAPER? Culinary parchment paper, also called kitchen parchment and bakery paper or baking paper, is a cellulose-based paper that provides a disposable, non-stick surface. It is a popular aid for oven cooking: It saves greasing and enables easy clean-up. It also is used to create a packet for moist-heat cooking in the oven—for fish and shellfish, poultry, vegetables and so on. The French call this technique en papillote (on poppy-YOTE); it is al cartoccio in Italian, and cooking in parchment in English. The food is put into a folded pouch (parcel) and then baked in the oven. You can also cook in parchment on a grill, up to 425°F, using a metal plate on the top rack and closing the lid. Unlike aluminum foil, the parchment won’t scorch. Don’t confuse parchment with waxed paper, which has a thin coating of wax on each side to make it nonstick and moisture-resistant. Unlike parchment paper, it is not heat-resistant; the wax can melt and the paper can ignite in the oven. Parchment paper is impregnated with silicone, which prevents it from catching fire. But you can do the reverse: In most applications that call for wax paper as a non-stick surface, you can substitute parchment. Culinary parchment has only been available since the 19th century. The earliest reference we have found is in the London Practical Mechanics Journal in October 1858. We don’t know when it was applied to culinary use. Some sources cite the early 20th century. The 1858 reference suggests architects’ and engineers’ plans (today’s blueprints), tracing paper, bookbinding and maps. 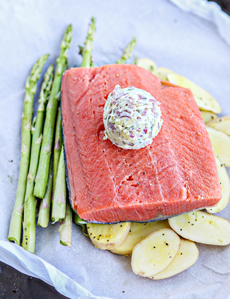 Salmon cooked in folded parchment paper (photo courtesy PaperChef). 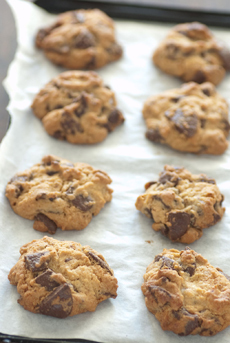 Cookies baked in a pan lined with parchment (photo courtesy Jules | Wikipedia). Oil-soaked or buttered paper, for baking and roasting. Buttered paper was put on top of a roast to stop it from cooking too quickly—the way we use foil today. 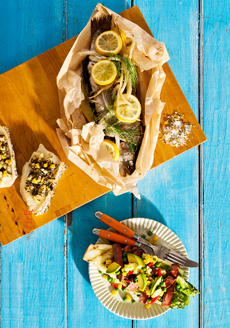 Fish was cooked en papillote in a parcel of paper brushed with olive oil. 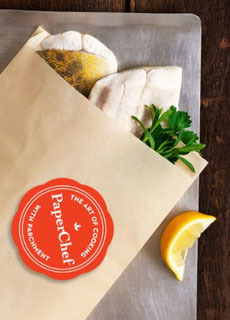 Fish was cooked en papillote in a parcel of paper brushed with olive oil. Brandy-soaked paper circles were used to seal fruit jams and preserves. Beyond skimming, excess grease was removed from the top of a stock or soup with ink-blotting paper. Today, paper towels do the trick. Parchment used as writing paper dates to ancient Egypt. It is a completely different animal, so to speak: It is made from sheep and other animal skins, and was first created as scrolls, with the skins trimmed and stitched together as required. Animal parchment is still used for applications from college diplomas to religious texts. What the two parchments—animal and vegetable—have in common is their creamy white color. Low-fat cooking with fewer calories: You can cook healthier meals, without the need for added fat. No vitamins are “washed way” in the cooking process. Convenience: The parchment packets may be prepared up to a day in advance, and are perfect for a single serving when you are cooking for one. It’s non-stick, non-scorching, and clean-up is a snap. Leftovers can be reheated in the oven without drying out (or becoming mushy, as with the microwave). Flavorful and tender: Moist heat cooking captures and imbues the food with anything you add to the packet: aromatics (garlic, ginger, scallions, sliced lemon or lime), herbs, spices, wine and liquids from coconut milk to sauce and stock. The method produces very tender meat and vegetables. Simple yet elegant: Parchment entrées are impressive at the dinner table. At a restauraunt, it is traditional for the maitre d’ to slice open the paper in front of the guest, delivering a delightful gust of aroma. At home, when everyone cuts open his or her packet, the effect is the same. Environmentally friendly: Parchment is 100% biodegradable and FSC* certified. Kosher: PaperChef is kosher-certified by Star-K and OU. Reynolds parchment and foil are certified kosher by OU. *Forest Stewardship Council (FSC) certification means that the materials have been sourced in an environmentally-friendly, socially responsible and economically viable manner. More many decades, cut sheets, or those cut from a roll of parchment, were the options for lining baking pans, cake and pie tins, casseroles and the like. Different formats evolved to meet consumer needs. 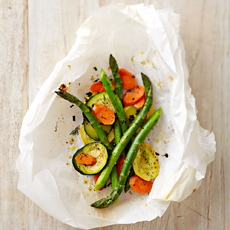 Parchment sheets are the most convenient way to cook with parchment paper. Simply grab a pre-cut sheet to line pans, bakeware and cookware. You can buy rectangles as well as rounds. Parchment rolls are a multipurpose kitchen paper. Like foil and waxed paper, you pull out the amount you need and cut it on the serrated package edge. Parchment cooking bags are a recent innovation and our favorite parchment product. Just toss the ingredients into a bag, fold and cook. It saves the time of cutting a piece of paper to size and folding into packets. Parchment baking cups allow muffins to slide out of the pan—like cupcake papers for muffins. We also like them to create perfectly round baked eggs, for Eggs Benedict or other fancy preparation. Lotus cups are deeper, for larger muffins. Tulip cups are made to add panache to specialty cupcakes, with a petal-like top for an impressive presentation. They’re all over the Web, including on the website of PaperChef.com.